The module has a pinout and interface that are nearly identical to those of A4988 stepper motor driver module, so it can be used as a higher-performance drop-in replacement for those boards in many applications. 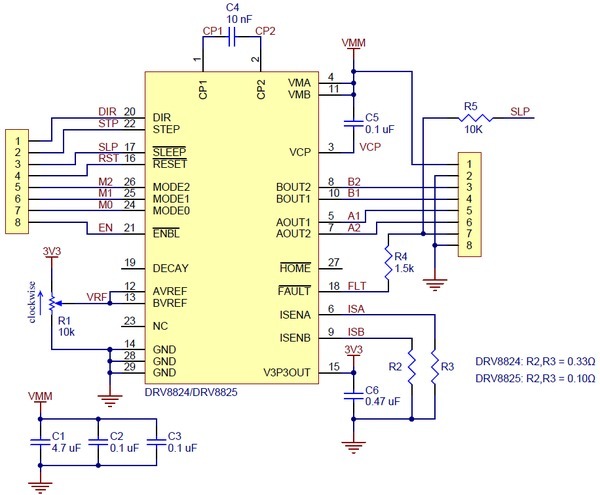 The DRV8825 stepper motor driver features adjustable current limiting, overcurrent and overtemperature protection, and six microstep resolutions (down to 1/32-step). It operates from 8.2 – 45 V and can deliver up to approximately 1.5 A per phase without a heat sink or forced air flow. Works fine. Be better if the vref, used to set the current limit to the motor, were routed out to a pin or even a large pad you could easily get a probe on. Also, 0.1 ohm resistors are a bit too small on the current sense lines. My stepper is rated at 1.2A and thus, requires a vref of 0.6v. vref = 1.0v.